When it comes to popular watch brands, the name Casio immediately exudes quality and rugged design. The watch maker’s popular rugged G-Shock series is perhaps one of its well-known products. Unknown to most people, Casio is actually a big contender in the growing smartwatch market. In fact, the company has released the second-generation of its flagship men’s smartwatch, called the Casio Men’sPro Trek Smart WSD-F20 GPS. The brand new generation smartwatch shares a lot of similarities to its predecessor, the Pro Trek Smart WSD-F10. This time, however, the new wearable device sports a built-in GPS tracker. This feature should be a welcome addition for users who are into extreme sports and progress tracking. The Casio Pro Trek Smart WSD-F20 is without a doubt one of the biggest watches available in the market today. Despite its large size, the watch doesn’t really feel like it’s too big on the wrist. Compared to the WSD-F10, the new model is also a bit slimmer. The watch is way tougher than it looks, boasting a MIL-STD-810F certification. This means that it can take almost any kind of beating during outdoor activities. The watch can even survive up to 50 meters underwater. Unlike other circular smartwatches, the Pro Trek Smart’s 1.32-inch screen is not entirely round. There is an out-of-place bar at the bottom of the screen, which might be off-putting for some users. Putting the “chin” aside, the display itself is very legible, even in direct sunlight. Casio has implemented a rather unique technology into the Pro Trek Smart WSD-F20 in the form of a dual-layer LCD display. This technology is like the one placed on last year’s model. One screen is basically a color LCD screen that shows the watch’s different outdoor features and mobile notification. The other screen is a monochrome display that gives basic information such as the time and the date. Through the use of the monochrome LCD when not in active use, the watch itself can apparently last up to a month on a single charge. Those that are familiar with Android Wear 2.0 will have no problems getting used to the interface. The watch boasts three metal buttons placed on the right side of the watch. The top button lets users navigate through the watch’s different features. The middle button lets users launch apps, while also doubling as a back button. The final button on the bottom lets users automatically show a map with their current location. 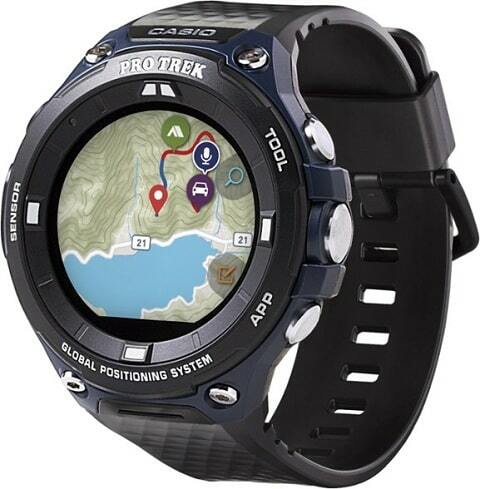 The outdoor features of the Casio Pro Trek smartwatch utilize many built-in sensors. This includes a built-in compass, barometer, tide graph, GPS, and altimeter. Outdoor enthusiast will particularly appreciate the built-in barometer. The sensor tracks current atmospheric pressure to predict possible weather changes. The Casio Pro Trek Smart WSD-F20 runs the latest version of Wear OS. This means that users will have access to the different apps that are available on the Google Play Store. Google Assistant is also present on the watch. The virtual assistant allows users to make commands and instant queries by simply saying “OK Google” directly onto their wrist. Through the use of the operating system, users can also directly access their Smartphone’s functions, such as text messaging and calls. Social media notification can also be set up to let users see important information through their smartwatch. Users looking for a smartwatch with all the bells and whistles for their trek through the woods may want to consider getting the Casio WSD-F20. The watch’s MIL-STD certification is also something to consider, given that users will likely have a hard time breaking it. Given Casio’s reputation for quality, getting this particular smartwatch is a sound investment.